Does Your Car Insurance Policy Cover Your Pet? | Hupy and Abraham, S.C. Does Your Car Insurance Policy Cover Your Pet? When we welcome pets into our homes, they quickly endear themselves to us and become part of the family. As such, we often take pets along for road trips, errands and even joy rides. In a perfect world, you wouldn’t have to worry about your pet’s safety and well-being in the aftermath of a car accident. But because accidents happen, there are a few things to consider before taking a spin with a pet in your vehicle. People often view pets as part of the family, but insurance companies don’t. An insurance policy might cover every penny for damages to you and your passengers, but probably won’t do the same for your pet. If your pet incurs large medical bills in a car accident, your insurance provider will probably classify your pet as “property.” For instance, if your pet needs $3,000 in medical care, they might assign a $400 value to your pet and offer $400 to replace your “property” instead of paying the $3,000 medical bill. In some cases, judges and juries have rejected that argument, and forced the insurance company to pay the full cost of the pet’s medical bills. However, those judgments don’t guarantee similar rulings in other cases. Not too long ago, the idea of pets being covered by a car insurance policy was unheard of. In 2007, Progressive became the first insurance company to add $1,000 of free pet-injury coverage to policies for cars, boats and RVs. A collision or comprehensive coverage claim will pay up to $1,000 for veterinary costs or a $500 death benefit under that policy. But it comes with a few caveats. For one, it only applies to cats and dogs, thus excluding any type of exotic pet. And if you’ve ever treated a seriously injured pet, you know $1,000 won’t go very far. In general, auto coverage for pets is still hard to come by. If you regularly drive with a pet, ask your insurance agent how you can insure your pet. 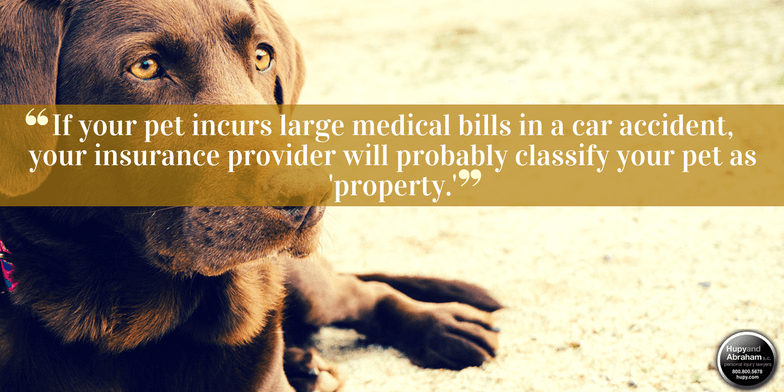 In some cases, they might sell you “pet insurance,” which covers injuries (including car accidents) and illnesses similar to how health insurance covers humans. Alternatively, your insurer could build in an “accident-only” policy that would only apply to injuries sustained by your pet in a car accident. Most pet insurance plans are going to have low limits. If you’re looking for more comprehensive coverage, you can try reputable pet insurance companies such as Healthy Paws, Pet Plan and Trupanion. As painful as it is to say, cars aren’t as safe for pets as they are for humans. Seat belts and passenger seats are made for the long, two legs of humans, but not the short, four legs of cats and dogs! But sometimes you absolutely must take your pet for a drive. In that case, here are some (other) things you can do to keep your fury family members safe! Don’t let your pet ride shotgun – We don’t let small children ride in the passenger seat because it’s not safe and the same should apply for your pet. Keep your pet’s head inside the window – Letting your pet stick its head out the window is great for a picture, but leaves your pet extra vulnerable if an accident occurs. Choose a proper vehicle – Some vehicles are better suited for pets than others. One with a large back seat is preferable. Bring a crate – When we travel with small children, we keep them safely contained in car seats. Likewise, you can keep your pet safely contained in a crate. We all cherish our pets and certainly don’t view them as “property.” Just remember, your insurance company doesn’t love your pet as much as you do, so it’s best to double-check to make sure your pet is covered.